Tiny parasitic wasps could be used as pesticides to protect crops after researchers carried out the most detailed ever study of the creatures. A group of scientists who sequenced the genomes of three parasitic wasp species say their work has revealed that the tiny insects have features useful for both pest control and medicine, and could even improve understanding of genetics and evolution. In a study to be published in Science magazine, lead researchers John Werren, a professor of biology at the University of Rochester in New York, and Stephen Richards at the Baylor College of Medicine, Texas, described their tiny subjects: "Parasitic wasps attack and kill pest insects, but many of them are smaller than the head of a pin, so people don't even notice them or know of their important role in keeping pest numbers down," Prof Werren said. "There are over 600,000 species of these amazing critters, and we owe them a lot. If it weren't for parasitoids and other natural enemies, we would be knee-deep in pest insects." The tiny insects lay their eggs inside often much larger hosts, including caterpillars. When the eggs hatch, they kill the unsuspecting host from the inside out. But the wasps only target specific insects, acting like "smart bombs," according to Prof Werren. "Therefore, if we can harness their full potential, they would be vastly preferable to chemical pesticides, which broadly kill or poison many organisms in the environment, including us." 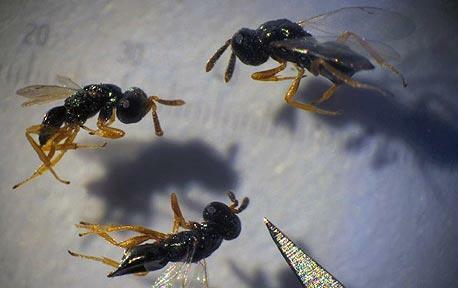 The wasps, which all fall in the Nasonia genus, also offer promise for genetic research. Like the fruit fly, a common genetic research subject, the wasps are small, easily grown in a laboratory and reproduce quickly, but the wasps have only one set of chromosomes. "A single set of chromosomes, which is more commonly found in lower single-celled organisms such as yeast, is a handy genetic tool, particularly for studying how genes interact with each other," Prof Werren said. The scientists also uncovered that the wasps have acquired genes related to the human smallpox virus, a discovery that may have applications for the study of evolutionary processes. "Emerging from these genome studies are a lot of opportunities for exploiting Nasonia in topics ranging from pest control to medicine, genetics, and evolution," Prof Werren said.